Last week I felt dehydrated. I was drained, and woke up every day with a headache. Obviously my body was lacking water, but I felt like I was drinking loads. It was absolutely delicious and incredibly filling. Remember, a lot of the time you feel hungry, your body is actually just thirsty. You’re dehydrated. Our bodies are about 60% water! And I know I’m not the first blogger to point that out! This is not me saying that every time you’re craving something to eat, you should just drink water. You need to know your own body and judge every feeling individually. I know when I’m occasionally feeling faint and my body actually really needs fuel, and I also know when I’m just restless and a bit dehydrated, so I’m reaching for the peanut butter and the teaspoon! But this salad did just the trick. It filled me to the brim, and I was peeing non-stop for the rest of the day (now we’ve discussed going to the toilet, we’re all very good friends). Try it yourself and notice how good you feel. It’s not just the water in all those vegetables, but the nutrients in so much raw food. Enjoy! 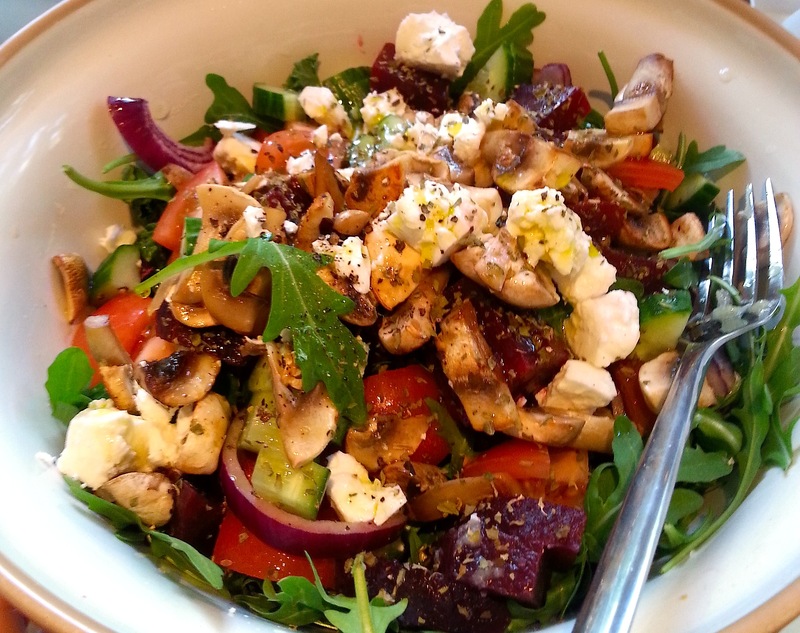 See my post on Lucy Salads for other suggestions for mammoth-sized salad bowls to fill you up, and see my post on greek food for breaking down the various advantages of such a salad. And finally, read here why kale is such a fantastic way to bulk up your salad.